Boathouse 4 offers hands on children’s activities and a brand new indoor mast climbing experience. 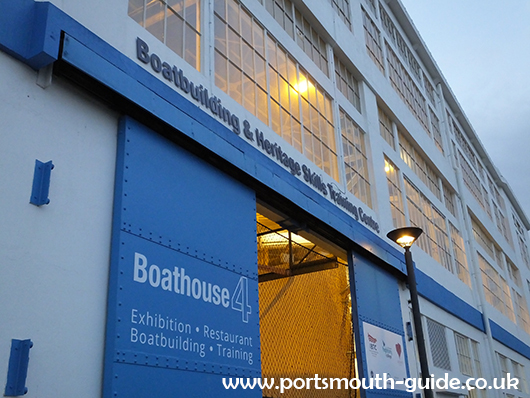 The building was constructed during the rearmament period before the World War II and has been restored and converted into a Boatbuilding Skills Training Centre and will be home to the International Boatbuilding College Portsmouth and Highbury College. Built within this magnificent historic building, overlooking the Boatbuilding Skills Training Centre is a new exciting exhibition “The Forgotten Craft” which tells the heroic stories of the small boats which were the backbone of the Royal Navy. From the wooden cutters that ferried Lord Nelson to and from his flagship, to the Cockleshell Heroes in their canoes and the powerful motorboats that helped to win the Second World War.